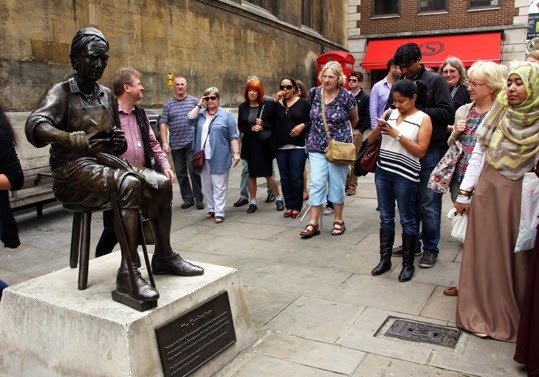 On Sunday I went on a guided walk called the Secret London Tour. It offered to reveal hidden parts of the city, things and places not shown on the usual tourist tours. It sounded just my kind of thing, although I wasn’t entirely sure I’d see anything I didn’t already know about – after all, I’ve lived in London most of my life and know it reasonably well. All I can say is, I know London a bit better now. Although the tour did cover a few places I’d already visited – the wonderful Postman's Park, for example – it also revealed plenty that was absolutely new to me. For example, while I’d passed the statue of a cordwainer in that picture at the top before the walk, I certainly didn’t know that cordwainers were responsible for making the extremely long, pointy-toed footwear fashionable back in medieval times. Neither did I know that the Church considered pointy shoes to be such a sign of the sin of vanity that it banned them beyond a certain length. The Devil, a man of wealth but not of taste back then apparently, was often depicted wearing those sinfully long toes. Tour guide Richard Jones, who is also the author of several books including Walking Haunted London and Haunted London, is extremely knowledgeable about the history and legends of the city and talks about it in a really entertaining manner. I’m not going to give away too many of the secrets he reveals on the walk as that would spoil the fun if you decide to go on one yourself. 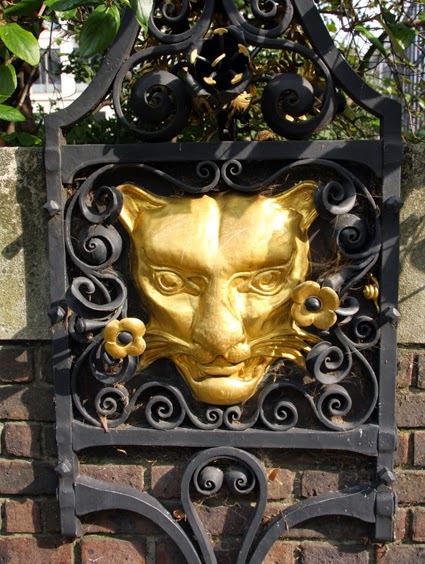 I have included a couple of other photos I took though, showing fabulous golden beasts Richard pointed out. 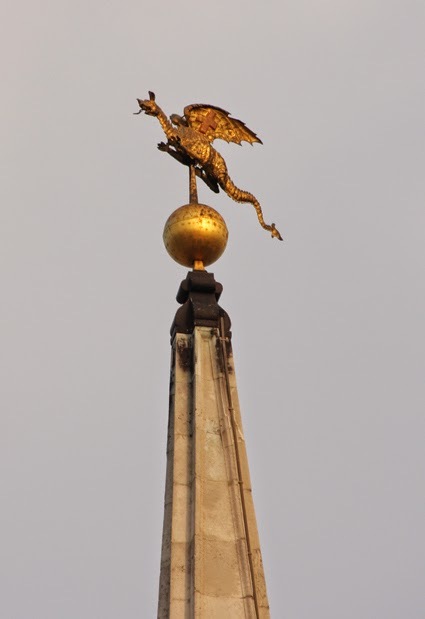 You can see the dragon atop the steeple of St Mary le Bow church and a leopard mask in the gardens by Goldsmiths’ Hall.